Dark Souls II is the sequel to the critically acclaimed action RPG from 2011 that earned a reputation for it’s difficult gameplay and gained a cult following among fans. 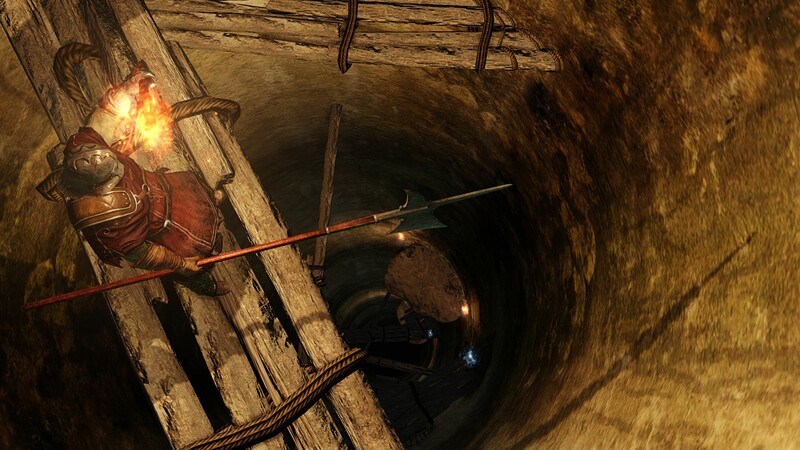 Dark Souls and its predecessor Demon’s Souls let players explore diverse, dark fantasy environments and challenged with it’s grand gauntlets and boss fights. Going against the conventions of tutorials, quests and general hand-holding, the Souls games rewarded players for learning by playing and brought back a sense of adventure and trepidation absent from modern games. This same mantra is prevalent in the sequel and has many new surprises along the way. Players take control of a cursed individual, whose humanity ebbs away but cannot truly die, they travel to the land of Dragleic in hopes of a cure but are not even certain they might find it. Upon arrival they are helped by the Firekeepers to temporarily regain their vitality and meet with the Emerald Herald who commands the bearer of the curse to gain strength by harnessing the souls of the Old Ones and only then can they seek the King. This time players have a lot more variety when it comes to customising their character’s appearance with facial hair and tattoos as new additions. RPG starting class archetypes like Knight, Cleric, Mage etc. make a return but don’t necessarily tie you into a certain playstyle for the rest of the game but only dictate your initial stats. Once more players gain souls in combat by defeating enemies and can be used for leveling up and is the games currency. New to the series is the Soul Vessel item, which can be used to redistribute the leveled souls if you wish to drastically change playstyle, a great new addition. Throughout the journey, players will regularly visit Majula, a small village acting as the games hub. Return here to rest, level-up and eventually you will unlock vendors and blacksmiths providing services. Various paths branch out from Majula leading to the game’s main areas, making a return are the bonfire checkpoints where players are able to refill health flasks, spell uses and can now be freely, fast traveled between once lit. Environments are distinct and rich, ranging from a prison at sea, to poisonous quarries and a shanty town constructed at the bottom of a pitch black pit. Half of the enjoyment is in uncovering these new areas, cautiously creeping through a waterlogged cave to uncover a pirate cove for the first time was breathtaking and definitely a highlight of the whole series. The game’s enemies are suitably twisted and disgusting, appropriate to their areas, which brings me to combat. Fights are still exhilarating, feeling like duels where attacks should be timed and deliberate to take an enemy at a moment of vulnerability. Learning how enemies telegraph their moves and being able to perfectly time a parry and riposte still feels great. When it comes to weaponry you are truly spoilt for choice, hundreds of different blades, polearms, hammers and magics are available and can be all made viable through a revised upgrade system that is now more straightforward than the first game. Dual wielding weapons has now been properly implemented and providing you have the right stats you can now power stance weapons of a similar class for more sophisticated movesets. Boss battles remain the series’ highlight, testing skill against intimidating monstrosities that often dwarf the player and are accompanied by a bombastic orchestrated theme. Some creative new bosses include The Royal Rat Vanguard which takes place in a tomb that fills with a swarm of rats and The Looking Glass Knight who is actually able to summon other players to help him in the fight. What is perhaps a little disappointing is a lot of the bosses are similar or in some cases straight copies of ones found in the first Dark Souls, others seem to fit a mould of “Large humanoid with big weapon” that are no less fun but can feel uninspired. The area which has seen the most improvement is the online features, with new dedicated servers everything runs more smoothly. Covenants have been improved and each now serve a clearer purpose. The Heirs of the Sun can be joined by players who wish to help others with boss fights, the Brotherhood of Blood, Blue Sentinels and Way of Blue are for invading other players games, Policing said invaders and to instantly summon protection, respectively. Most exciting is the new Rat King covenant which summons players to your game where you set up booby traps in a Home Alone style fun house and also the Bell Keeper covenant which tasks members to defend a church bell from invaders. Dark Souls II is an essential purchase for brave souls who fear not death, for those who crave a challenge and adventure. Though it may not reach the legendary plateau of it’s predecessor, it certainly comes close.